National tragedies such as Hurricanes Katrina and Sandy, earthquakes, serious fires, and any other event that destroys the homes and livelihood of employees require an appropriate response from employers. Even more minor issues like a foot or two of snow, the loss of electricity, or flooding can make the actual physical presence of employees at work difficult or impossible, sometimes for days. Beyond the effect of these events on employees, they are also likely to affect the ability of the business or organization to remain open and serving customers. Finally, inclement weather or other business emergencies affect not just the employee but the employee's family members, too. In most weather emergencies schools, daycare, nursing, and other services employees use become unavailable as well. Consequently, employers need to think through the possible emergency events that could disrupt their ability to open. They need to formulate policies about what employees can expect when inclement weather makes it impossible to get to work. It is much better to be prepared than to try to set policy on the fly in the event of an emergency. Employers have legal obligations to employees, and they have a relationship, moral, and ethical obligations to employees, too. Many employees believe that, in the event of an emergency, the employer should cover all related costs. This is not always feasible. For example, if an employee misses three weeks of work because his home was flooded and without power, is it fair to assume that the employer will pay the employee for the extended time off? Of course, not. The employee will need to use paid time off, vacation time, or apply for extended unpaid leave. On the other hand, in situations where the employer cannot open the business, it is reasonable to ask employers to shoulder some of the costs to maintain their relationships with their employees? Absolutely. But even in this circumstance, the employer will not be able to afford to pay non-working employees for an extended period. The employer needs to balance paying employees with the need to ensure that said employees will still have a job when the business reopens if the business is not taking in money from customers. So, the inclement weather policy must set expectations, present a balanced approach to employee compensation, mitigate risks for both the employers and the employees, and present a fair solution for emergencies. The inclement weather and other emergency policy should be researched, created, communicated, and signed in advance of any inclement weather or other emergency events. When employees know what to expect, they can plan and feel confident about the employer’s predicted actions. This promotes an environment of trust. 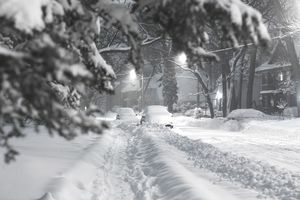 Earlier recommendations covered what employers need to do about pay legally when a snow day, rain day or another emergency affects their employees' ability to work. You'll want to make sure that you are fulfilling the legal obligations that you have about paying your employees. These recommendations constitute an inclement weather policy that informs employees about what they can expect from their employer in response to an emergency. The policy focuses on the areas that a weather emergency or other emergency will most frequently affect. When an employee needs time to repair damages and problems caused by an emergency, bad weather, or other situation. You may adapt this bad weather policy for your organization and your organization's culture, but keep in mind the potential disasters in your region as you write your policy. You will want to customize this sample inclement weather policy for your organization.